A pizmon (ritual poem) of eight stanzas, signed with the acrostic of Abraham Ḥazan, and sung in the Sephardic ritual before the commencement of the New-year's evening prayer, the refrain running, "May the year end with her woes!" changed in the last stanza to "May the year begin with her blessings!" The author, a cantor who was born in Salonica in 1533, was probably also the composer of its beautiful melody in the hypo-dorian mode (minor scale without the leading note) which has been slightly developed in the course of tradition. This melody has many striking points of similarity to contemporary airs from the region of the Greek archipelago, such as those analyzed by Bourgault-Ducoudray, which, he remarks, possess a certain amount of Italian coloring. 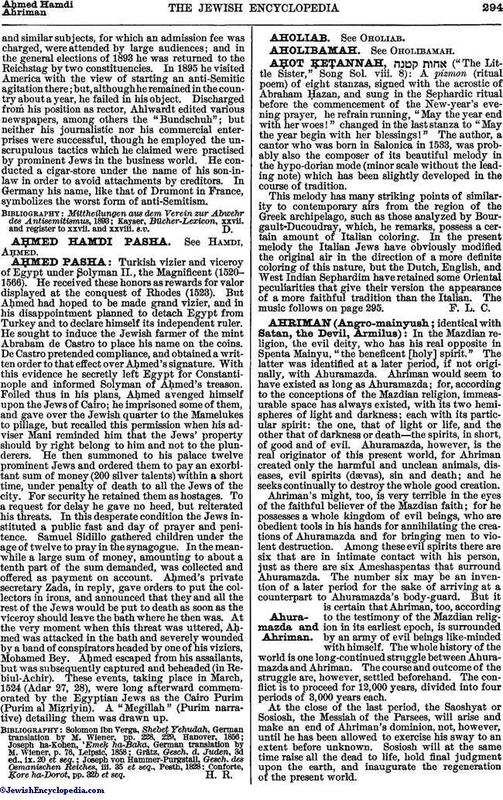 In the present melody the Italian Jews have obviously modified the original air in the direction of a more definite coloring of this nature, but the Dutch, English, and West Indian Sephardim have retained some Oriental peculiarities that give their version the appearance of a more faithful tradition than the Italian. The music follows on page 295.